The Angriest: Star Trek: Deep Space Nine: "Hard Time"
Star Trek: Deep Space Nine: "Hard Time"
It's 15 April 1996, and time for another episode of Star Trek: Deep Space Nine. 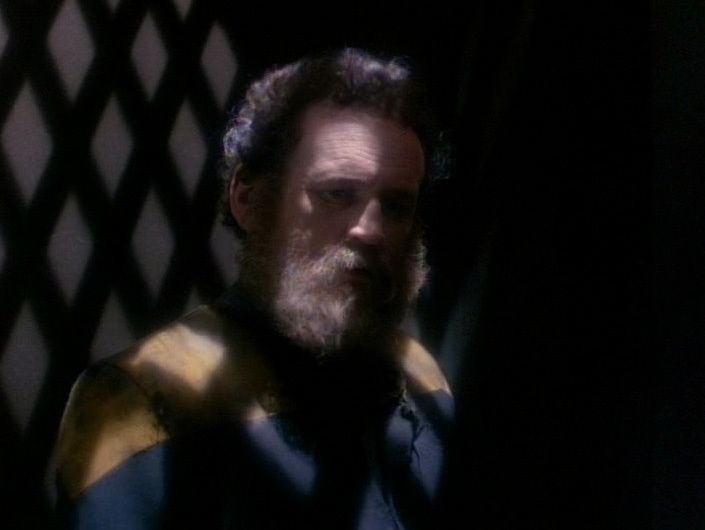 Chief O'Brien (Colm Meaney) has been falsely convicted of espionage against the Argrathi. By the time Major Kira (Nana Visitor) has arrived on the Argrathi homeworld to assist, O'Brien has already been tried, sentenced and convicted. His punishment: the memory of twenty years imprisonment has been implanted into his mind. Now he must adjust to life back on Deep Space Nine after two decades away, while his wife Keiko (Rosalind Chao) and his colleagues must come to terms with a man deeply changed overnight. Putting Miles O'Brien through an emotional torture appears to be an annual tradition for Deep Space Nine. They tortured him in "Whispers", they did it in "Tribunal", they did it in "Visionary", and a fourth time in "The Assignment". Now they present the most emotionally battered O'Brien yet, in an episode pretty much entirely devoted to post-traumatic stress disorder (PTSD). It's not surprising that the production team would rely so readily on O'Brien for these kinds of stories. Within the series he acts very much as a traditional everyperson: he's not a military officer, and unlike most other Star Trek characters he has a wife and daughter with a second child on the way. He is the closest thing in the franchise to the television viewer at home, and that means putting him through an emotional wringer will automatically bring with it a stronger connection. It also does not hurt that Colm Meaney is a sensational actor. He does a very strong job here, as a belligerent O'Brien continues to insist he is fine and needs to be left alone despite increasing acts of aggression and emotional upset as the episode goes on. There is also a clever little mystery at the episode's heart, since O'Brien tells Dr Bashir (a similarly strong Alexander Siddig) that he spent 20 years alone in his cell. Flashbacks to his imagined incarceration reveals that is simply not true, and even when back in the present O'Brien continues to suffer momentary hallucinations of a benign cellmate named Ee'char (Craig Wasson). Wasson is wonderful, and gives the episode an added emotional boost as the inevitable reason for O'Brien hiding his existence becomes clear. If there is a downside to the episode, it is that the subject matter chosen for it is simply too large for a self-contained episode. Recovery from an experience like O'Brien's should take months, and to an extent he should never fully return to the person he originally was. The episode within its own confines does a superb job, but it's clear that it can't finish the job it starts - or, to be honest, to fully express the experienced of post-traumatic stress within the limits of its broad family audience. It is an admirable attempt, and does the best job that it can, but it's fighting an impossible battle. The episode is directed by Alexander Singer. He does a typically strong job, with a nice visual eye and all-round great performances. Sadly this was his last episode of Deep Space Nine, although he did continue to direct for Voyager. This is a strong episode, the 12th so far this season out of 18. That lifts the quality ratio up to 67 per cent, with seven more to go. Star Trek: Deep Space Nine: "The Muse"
Star Trek: Deep Space Nine: "Shattered Mirror"
Crusade: "The Rules of the Game"
Star Trek: Deep Space Nine: "Rules of Engagement"